It is Monday again, so time for another meat free dish. I had half a large sweet potato sitting in my fridge, so I went looking for a healthy, vegetarian dish to use it in. I went straight to www.healthyfoodguide.com.au rather than my cookbook collection for this one, as I wanted to find something that I knew would be healthy and vegetarian. Unfortunately in the end I didn’t have quite enough sweet potato (I only had 300g) for the recipe, so had to buy another on. Which meant once again I ended with half a sweet potato left, defeating the purpose of finding a recipe to use it up, but at least I had a nice healthy dinner! I’ll use the rest of the sweet potato in a roast vegetable salad, frittata or soup later in the week. The addition of the ground coriander and cumin really added a nice depth of flavour and complimented the sweet potato, while the mint and tzatziki added some freshness. The leftovers also make a great lunch. In a large mixing bowl, combine the sweet potato, zucchini, mint (or coriander) and onions. In a separate bowl, combine the flour, ground coriander and cumin, eggs and milk. Whisk until smooth and then add to the sweet potato mix. Stir until well combined (I found it was easiest to do this with my hands). Place a large frying pan over a medium-high heat and spray with cooking oil. I used two frying pans so it wouldn’t take as long to cook all the fritters. Spoon a ¼ cup of the mixture for each fritter into the pan, flattening slightly. Cook three fritters at a time for 3 minutes each side, until golden and cooked through. Continue until all the mixture is used, spraying with more oil in between if needed. 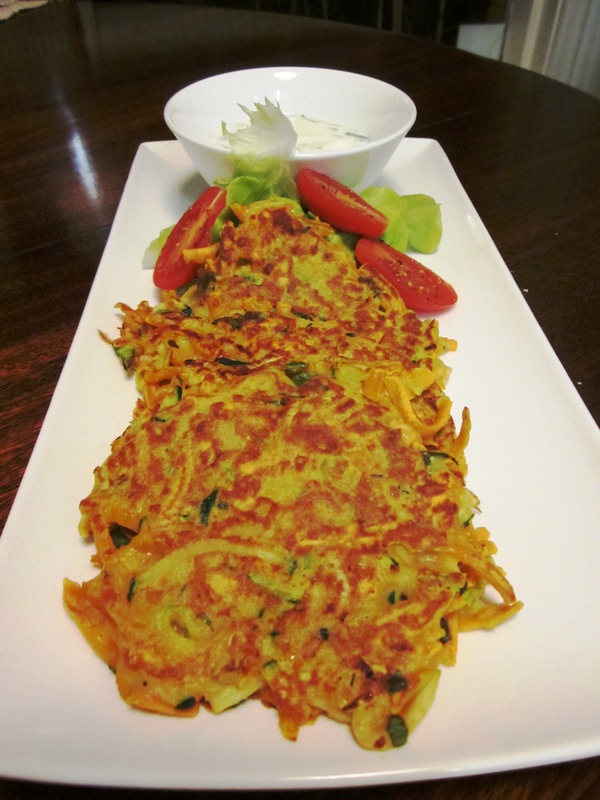 Serve (4 fritters per person) with salad and yoghurt or low fat tzatziki. Note – be careful not to grate the vegetables too coarsely, or they won’t cook through. If you use a food processor with more than one grating option, use the thinner attachment.